PICTURES and specifications have been released of the new Lotus C-01 superbike, a prototype of which is road-registered and 'ready for action' according to the makers. These are the first official pictures of the C-01. Until now, only leaked computer-generated images have been seen. It makes a claimed 200hp using a tuned version of the 1195cc V-twin engine from KTM's RC8R. It's got a steel, titanium and carbon fibre frame, upside-down forks and a claimed dry weight of 181kg. Although it bears the Lotus name, that appears to be as far as the connection with the British car marque goes. The C-01 prototype has been produced under licence by German car racing team Kodewa and tuning firm Holzer Group. Colour schemes will 'pay homage to Lotus’ sporting pedigree'. A production version is due to go on sale within months. A release on the prototype said: 'Following two years of careful planning and intense development, Kodewa is delighted to announce that the prototype of the world’s first motorcycle to bear the legendary Lotus marque is now road registered and ready for action. 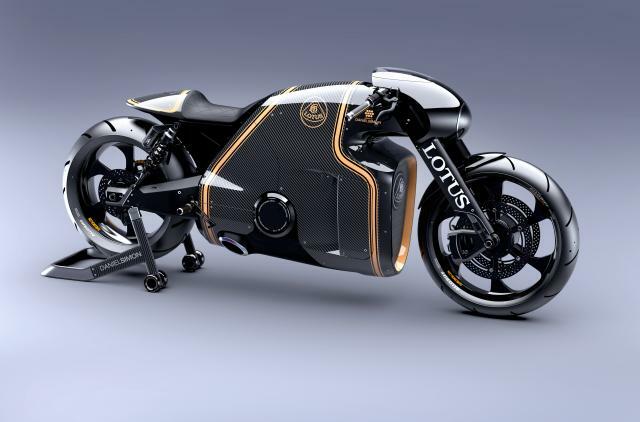 'Kodewa has been granted a license to produce the motorcycle by Group Lotus plc, the world renowned sportscar manufacturer and engineering consultancy. 'The C-01 combines ample power via a V-twin engine with a distinctive body designed by Daniel Simon integrating carbon fibre, titanium and aerospace quality steel. 'The C-01 motorcycle is not designed, engineered or produced by Group Lotus plc but is the result of a collaboration between motorsport veterans under the leadership of Kodewa, lead by Dr Colin Kolles. The development on the C-01 was carried out with the support of Holzer Group (co-owners of Kalex) and design guru Daniel Simon. Drawing on their wealth of motorsport experience, the team of engineers has designed a unique high performance superbike.